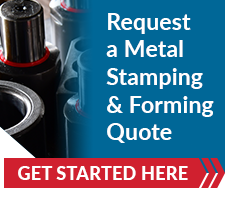 What should the metal stamping process look like with the right metal stamping partner? First, every great metal stamper should do more than simply stamp parts – and you should demand it. You need a short run metal stamping partner who understands your needs, works with you on process and design and provides support, even post-production. Of course, you also need output that exactly meets your specifications and is delivered on time. Our complete suite of custom and production metal stamping produces short and medium runs, encompasses a wide variety of ferrous and non-ferrous metals and meets the rigors of industries across the spectrum. Neway offers the solutions you need to ensure your short run metal stamping project is a success – without a doubt.